It's a fabulous looking amp, but how does it sound? 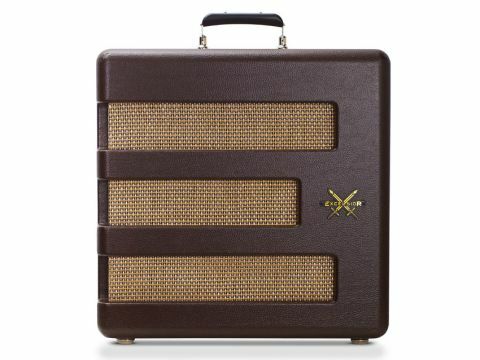 The go-to amp for credible old-school Americana valve sounds on a budget. Great looks. 15-inch speaker. Tremolo effect. All or nothing tone switch. Uncomfortable carry handle. The controls are limited to volume, tremolo on/speed and a bright/dark switch. There are also three input options - guitar, mic and accordion! How. Cool. Is. That? Forgive us from coming over all retro-nostalgic but after the umpteenth black box promising ever more than the last, it is a tonic indeed to come across an amp like the Fender Pawn Shop Special Excelsior that has no pretence whatsoever to being all things to all men. The irony, then, is that is actually is a great deal more versatile than you might think via its three inputs, two pseudo-Bakelite knobs, single tone switch, tremolo effect and 15-inch speaker. "Up closer the signs of cost-consciousness are there... Lest we be too harsh though - just look again at that bordering-on-silly price"
The inputs are for, wait for it, guitar, mic and... accordion. Now, if you were in New Orleans, for example, that might not sound so strange. The dear old squeezebox isn't quite the musical leper in many parts of the world that it is in the UK. But will you ever use it for an accordion? Er, maybe. Can you plug your guitar into it? Well, yes - it's a weaker, duller sounding input, but that might give you a tonal option or two. The mic input has a bit more level; not as hot as the guitar input, but blow a harp into an appropriate mic, give it some beans and all of a sudden you're Paul Butterfield. Sort of. Eventually to the guitar then. The Excelsior uses a pair of cathode-biased 6V6s to put out a stated 13 watts. The totally open-backed cabinet looks the part from afar. Up closer the signs of cost-consciousness are there: thin plastic vinyl, a particleboard cabinet and a generally adequate level of finishing. Lest we be too harsh though - just look again at that bordering-on-silly price. On the inside, it's very much modern Fender, albeit split with the preamp up top and the power section at the bottom of the amp. The circuits are simple, populated on PCBs with plenty of space - we can feel the soldering irons heating up now for all manner of mods that enthusiastic tweakers will bestow on their Excelsiors [while voiding the warranty and risking electric shock of course - Health & Safety Ed]. Loud, is the first impression: the Excelsior would make a fantastic clean-toned home amp, but it's also plenty loud enough for small rehearsals and little gigs. The 15-inch speaker and open-backed cab help to create an immediate 'big amp' feel. There's plenty of low-end, and a sense of air and spread that it's just not possible to get from a small enclosed cabinet. "Clean tones are very rewarding, especially when you add in some of the output bias tremolo effect"
As a result, clean tones are very rewarding, especially when you add in some of the output bias tremolo effect. It doesn't do machine-gun stutters, instead it's a lovely vintage-type oscillation that works wonders for all kinds of Americana, blues and the like. The bass/treble switch is a bit all-or-nothing; in the former position it's very dark sounding and in the latter adds both treble and a swathe of brightness. An additional rotary tone control like the Greta's would have been good, but in its absence, you can tame things from the guitar. Headroom disappears quickly as you wind up the wick, and powerful pickups have the Excelsior driving soon enough. It's a vintage-style drive that can get right into the kind of messed-up, lo-fi worlds of Jon Spencer and the previously mentioned Messrs Auerbach and White. Wound back to a lighter range of drives, these sounds sit in countless genres from pop and blues, to soul and country. Will it be loud enough? That depends entirely on your bass player and drummer; in Fender terms it's much closer to Blues Junior territory than Hot Rod Deluxe. It seems that Fender's sheer might allows it the luxury, on a product or two at least, to kick back, chill and make something that's just cool - pure and simple. So while everyone else slugs it out with features and benefits in the low-end valve amp market, in come the Greta and Excelsior with no such pretensions. The premise is simple: loads of fun, not much money and both unquestionably hit the bullseye on that. Improvements? Fender could use a more expensive speaker, heftier transformers, add reverb and a more upmarket ply cabinet to make it a tone-hound beast to compete with anything. Would you pay the extra £4-500 for it? It'd be a tough call. As it is, it gets 80 per cent of the way there for a ridiculously low price. In these times, that's the way to do it.